The end of the year is an interesting period to visit Paris. Though the days are short and the weather might not be optimal, there are plenty of opportunities for photographers. These include the Christmas decorations and illuminations. In Winter, the City of lights changes and gets ready for the last week of the year, a quite festive period. The French do not have anything like Thanksgiving, so the holidays take place at the very end of the year. But the City prepares for it in advance. 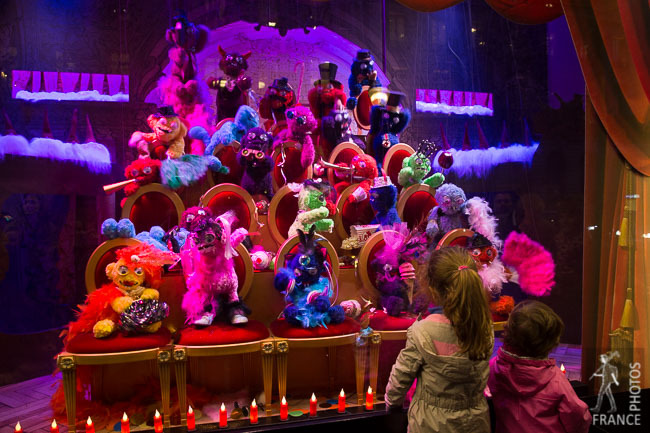 In 2014, Christmas decorations were set up in early November in the great department stores of the Boulevard Haussmann. 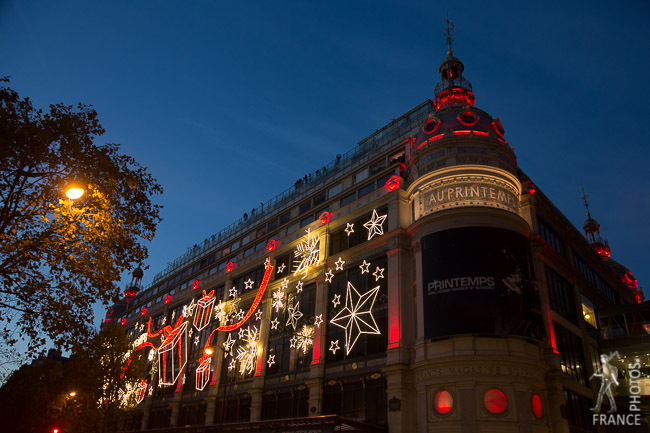 The Champs Elysées illuminations were also prepared at this period and they officially start around November the 20th. Decorations are tuned down after the New Year and taken out in Early January. So the optimal period to photograph them is between the 20th of November and 1st of January. If you brought a tripod and plan to take pictures of Christmas illuminations, be aware that they are mostly lit in the evening. Some lights are taken out in the middle of the night and they are not lit until it is night again. So the only period of time during which you can shoot is in the late afternoon / early evening. This table shows sunset times in Paris for the Winter. The blue hour takes place within half an hour of the sunset and is the optimal time to take photos. Afterwards, the skies gests too dark and looks pitch black on the photos. Christmas is the busiest season for the merchant districts of Paris, so expect lots of people walking everywhere, stepping in front of your camera or stumbling in your tripod. 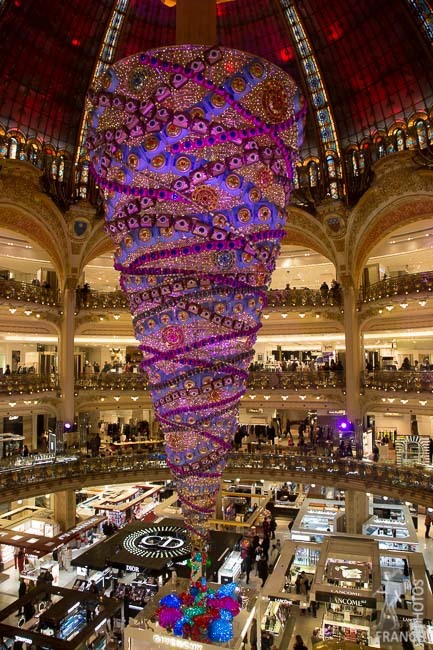 Each year, the Galeries Laffayette and Printemps department stores prepare special decorations for the Christmas period. These are both outside and inside the stores and are really attractive. The Galeries Laffayette Christmas tree changes every year and is always quite impressive. Both stores have a terrace on which you can benefit from an exceptional view of Paris for free. All you have to do is to find the right store (spot the terrace from outside before getting in) and climb as high as you can in it to access it). 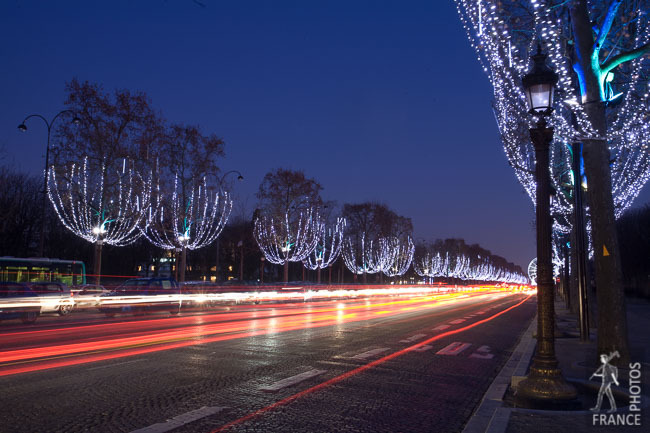 The Champs Elysées avenue has special lighting every Winter. To get the classic view, put your tripod near one of the pedestrian crossings, but mind the traffic, especially scooters that might get close to you when bypassing cars. The lower part of the avenue has a Christmas market that might be interesting. 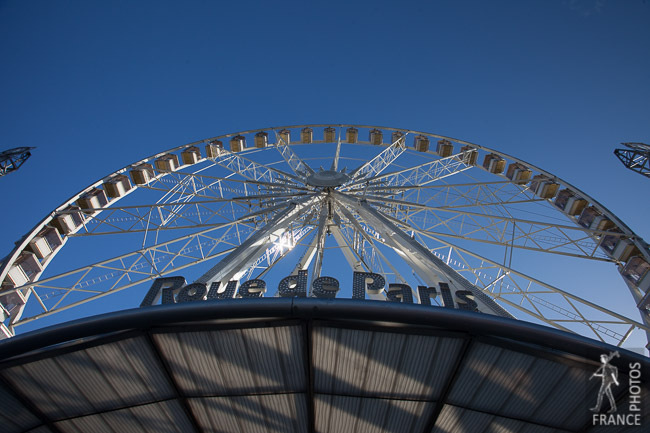 The massive Concorde square ferris wheel is not really a Christmas decoration, but it is only there in Winter. This square generally also has interesting Christmas decorations. 2014 is an exception: the Ritz hotel and colonne Vendôme are currently being restored, which makes it more difficult to capture nice views. The galerie Vivienne is beautifully decorated in Winter.